The rivulets of rain etch crooked patterns down the screens, filling one tiny square and then the next, in an oddly geometric path down. 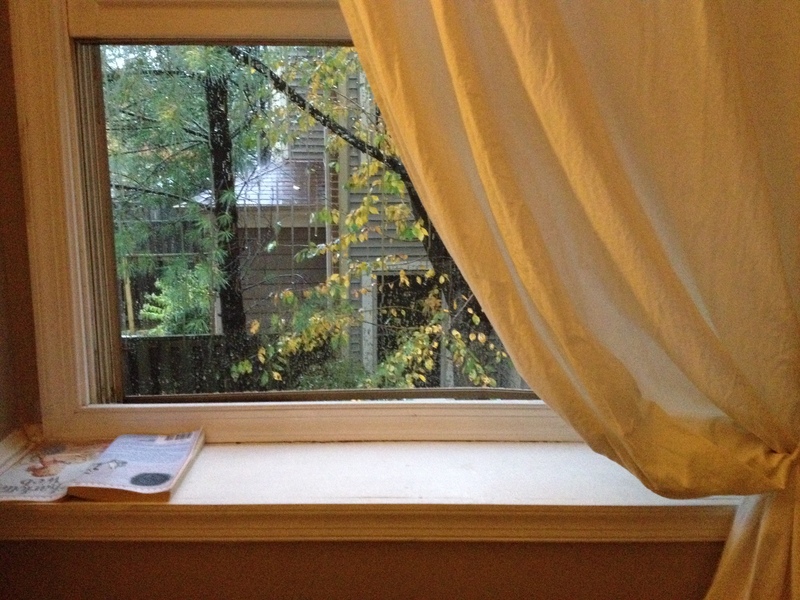 She had slept with the windows open, welcoming the temperamental storm. It rained, then stopped, over and over. Gusts of leaf-ladden loamy wind traced the sills, the curtains billowed, settled again in the thick, silver moonlight and she rolled over, seeking the shelter of sleep. The veil is thin, and rest uneasy. Her ancestors, centuries before crossing the ocean to the new world, would have lit fires and danced among the standing stones, honoring the dying of the year and those who lived beyond. Today, bearing their name and embers of their fire still, she dresses her children as creatures to scare and watches their joyfully celebration. The plastic pumpkins overflowing with sugar are remnants of meaning, shadows of ideas imagined by old human hearts to captures the elusive idea of spirit, of embodiment, of god. She shakes off the rumination. It doesn’t matter. But the veil is thin, and rest uneasy. In the new world, ancestors of others also felt the call to remember. Graves visited, swept, washed, and cared for— while children bring treats, and mothers pack careful picnics to share with those who live beyond. It is a day to honor, remember, speak the names of, and love one’s ancestors. These are not her traditions, but they are humanity’s tradition. The world over, during this time, something in our souls know, and hear. The veil is thin, and rest uneasy. It perplexes her. She knows her history, she knows the rapidly approaching holidays are based on pagan traditions that were co-opted by conquering crusaders. She knows the symbolism of the winter solstice, and the human desire to find the light in the darkest hour. She understands the impetus to place the celebration of the birth of the penultimate Sun King, despite His spring birth, at the time when the sun itself reemerges, at the nadir of the year, and regains again, it’s place of dominance in the heavens. The symbolism is powerful, thick and heavy with meaning. There are depths, layers without end, to delve into, untangling the gossamer threads of meaning, direction and divinity. She shakes her cloudy head again, and gazes out the window. The air is wet, but the rain has stopped and is now thick with birdsong- from every direction, a symphony in the leaves- the avian musicians invisible, but their song full of power, joy and undeniably. The veil is thin, and there is nothing to fear. How beautiful and well written. I love your refreshing perspective on this Halloween and the “pagan” holidays to come. This was just the read I needed that morning. I feel such a connection to my ancestors this time of year. Having spent much time thinking about my near and distant relatives as I put together my own spooky display. There is true affection there for me. The living and the dead exist together in the fall for real in my corner of the earth all around me. This morning, *this morning* dang it!